What kind of treatment your fracture needs depends on the type of injury you've sustained. But first — what is a fracture? A fracture occurs when a bone cracks or breaks under pressure of a force that exceeds the bone's ability to bend. Typically, this injury causes significant pain and a loss of function at the site of the injury. Fractures can happen a number of ways, but the most common causes of fractures are falls, sports injuries, motor vehicle accidents, and osteoporosis (weakened bones, usually due to age). Certain forms of cancer can also contribute to bone brittleness, which may result in cancer patients suffering fractures more easily (particularly in the wrist, vertebrae, and hip). The type of fracture you may experience depends on the force exerted on the bone and the angle of that force. If you've experienced a sports-related bone break or a motor vehicle accident, you may have a different type of fracture than what you might experience from osteoporosis or the repetitive stress of sports endeavors like running or jumping. Closed (simple) fracture. The fractured bone has not broken through the skin. Open (compound) fracture. The broken bone may have pierced the skin, or a surface wound may have broken the skin over the site of the bone break. Stable fracture. The broken ends of the bone line up. Oblique fracture. The fracture has an angled pattern and can either be non-displaced (the ends are aligned) or displaced (the ends are not aligned). Transverse fracture. The fracture line is horizontal. Comminuted fracture. The bone has shattered into three or more pieces (usually due to an extreme force). Greenstick fracture. Small, thin cracks form in the bone (more common in children). Compression fracture. These happen when two bones are forced against each other; compression fractures commonly affect the vertebrae and are frequently seen in older people with osteoporosis. Hairline fracture. A thin fracture, sometimes resulting from repetitive motion and over-use; for example, stress fractures in the shin caused by running. Athletes often seek sports medicine professionals to rehab hairline fractures. 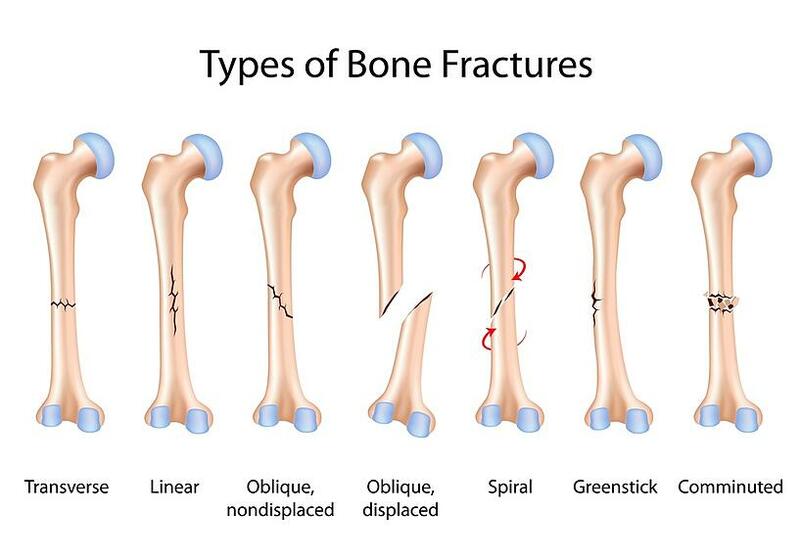 Fractures can happen to any bone in the body. Frequent injuries orthopedists see include fractures of the toe, foot, leg (shin or femur), arm (particularly forearm), shoulder, wrist, ribs, skull, vertebrae, and hip. Hip fractures are particularly of concern in older people because they can lead to serious disability. In the case of an open fracture that pierces the skin, bleeding may also occur. FRACTURE care: when is a cast not enough? You're probably familiar with the basics of fracture management: after receiving an examination and X-rays to confirm the break and how it should be treated, the broken bone is set and immobilized with taping (often seen in the case of toe fractures), a splint, or a cast made from plaster of Paris or fiberglass. In some cases, the patient may even be able to wear a brace or functional cast, allowing limited movement. Four to eight weeks later, the patient removes the cast and moves on to physical therapy. With all fractures, the doctor's main objective is to put the broken pieces back into position (called a "reduction") and immobilize them while the body heals itself. Broken bone ends will "knit" back together in time. Sometimes, however, doctors cannot complete the reduction process with a cast alone. Because fractures vary in severity and type, sometimes surgery and other techniques are necessary to reduce and immobilize the bone while it heals. Traction: a process through which bones are aligned or gently pulled into place with weights or pulleys. External Fixation: the temporary insertion, above and below the fracture site, of metal pins or screws that are attached to an external metal stabilizing frame. In some cases, orthopedic surgery may be necessary to insert metal rods or plates that can hold bone pieces together. For example, a surgeon may need to perform an open reduction and internal fixation (ORIF). This operation requires two steps: first, repositioning the bone into normal alignment; and second, holding the bone together with metal plates or screws attached to the bone's outer surface. If bone fragments are present, the surgeon may hold them together by inserting rods through the bone marrow cavity. People heal at different rates depending on age, general health, and the extent of the injury. A fracture may heal in as little as four to eight weeks or it may take months. Often, the pain of a fracture will resolve long before the bone is strong enough to bear full weight or resume normal activities. Be sure to follow your doctor's recommendations for rest and rehabilitation. When your cast, brace, or external fixation device is removed, you may be tempted to return to normal activities right away. Remember, though, that muscle strength is lost while an injury is immobilized. Your orthopedist will recommend specific exercises and physical therapy (e.g., sports medicine and aquatic therapy) to help you restore mobility, flexibility, and strength. After your initial examination, your physician may recommend you see a fracture care specialist about your options for immediate and ongoing fracture care and management. Coastal Orthopedics can help you explore your treatment options. Call us at our Corpus Christi location and make an appointment today!